Tobacco use is the cause of about 22% of cancer deaths. Another 10% are due to obesity, poor diet, lack of physical activity or excessive drinking of alcohol. Other factors include certain infections, exposure to ionizing radiation and environmental pollutants. In the developing world, 15% of cancers are due to infections such as Helicobacter pylori, hepatitis B, hepatitis C, human papillomavirus infection, Epstein–Barr virus and human immunodeficiency virus (HIV). These factors act, at least partly, by changing the genes of a cell. Typically, many genetic changes are required before cancer develops. Approximately 5–10% of cancers are due to inherited genetic defects from a person's parents. Cancer can be detected by certain signs and symptoms or screening tests. It is then typically further investigated by medical imaging and confirmed by biopsy. In 2015, about 90.5 million people had cancer. About 14.1 million new cases occur a year (not including skin cancer other than melanoma). It caused about 8.8 million deaths (15.7% of deaths). The most common types of cancer in males are lung cancer, prostate cancer, colorectal cancer and stomach cancer. In females, the most common types are breast cancer, colorectal cancer, lung cancer and cervical cancer. If skin cancer other than melanoma were included in total new cancer cases each year, it would account for around 40% of cases. In children, acute lymphoblastic leukemia and brain tumors are most common, except in Africa where non-Hodgkin lymphoma occurs more often. In 2012, about 165,000 children under 15 years of age were diagnosed with cancer. The risk of cancer increases significantly with age, and many cancers occur more commonly in developed countries. Rates are increasing as more people live to an old age and as lifestyle changes occur in the developing world. The financial costs of cancer were estimated at $1.16 trillion USD per year as of 2010[update]. When cancer begins, it produces no symptoms. Signs and symptoms appear as the mass grows or ulcerates. The findings that result depend on the cancer's type and location. Few symptoms are specific. Many frequently occur in individuals who have other conditions. Cancer is a "great imitator". Thus, it is common for people diagnosed with cancer to have been treated for other diseases, which were hypothesized to be causing their symptoms. Cancer can spread from its original site by local spread, lymphatic spread to regional lymph nodes or by hematogenous spread via the blood to distant sites, known as metastasis. When cancer spreads by a hematogenous route, it usually spreads all over the body. However, cancer 'seeds' grow in certain selected site only ('soil') as hypothesized in the soil and seed hypothesis of cancer metastasis. 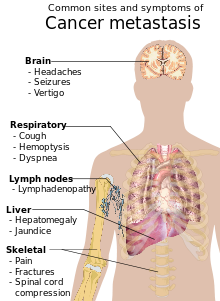 The symptoms of metastatic cancers depend on the tumor location and can include enlarged lymph nodes (which can be felt or sometimes seen under the skin and are typically hard), enlarged liver or enlarged spleen, which can be felt in the abdomen, pain or fracture of affected bones and neurological symptoms. Oncoviruses (viruses that can cause cancer) include human papillomavirus (cervical cancer), Epstein–Barr virus (B-cell lymphoproliferative disease and nasopharyngeal carcinoma), Kaposi's sarcoma herpesvirus (Kaposi's sarcoma and primary effusion lymphomas), hepatitis B and hepatitis C viruses (hepatocellular carcinoma) and human T-cell leukemia virus-1 (T-cell leukemias). Bacterial infection may also increase the risk of cancer, as seen in Helicobacter pylori-induced gastric carcinoma. Parasitic infections associated with cancer include Schistosoma haematobium (squamous cell carcinoma of the bladder) and the liver flukes, Opisthorchis viverrini and Clonorchis sinensis (cholangiocarcinoma). Non-ionizing radio frequency radiation from mobile phones, electric power transmission and other similar sources has been described as a possible carcinogen by the World Health Organization's International Agency for Research on Cancer. However, studies have not found a consistent link between mobile phone radiation and cancer risk. There is an association between celiac disease and an increased risk of all cancers. People with untreated celiac disease have a higher risk, but this risk decreases with time after diagnosis and strict treatment, probably due to the adoption of a gluten-free diet, which seems to have a protective role against development of malignancy in people with celiac disease. However, the delay in diagnosis and initiation of a gluten-free diet seems to increase the risk of malignancies. Rates of gastrointestinal cancers are increased in people with Crohn's disease and ulcerative colitis, due to chronic inflammation. Also, immunomodulators and biologic agents used to treat these diseases may promote developing extra-intestinal malignancies. Large-scale mutations involve the deletion or gain of a portion of a chromosome. Genomic amplification occurs when a cell gains copies (often 20 or more) of a small chromosomal locus, usually containing one or more oncogenes and adjacent genetic material. Translocation occurs when two separate chromosomal regions become abnormally fused, often at a characteristic location. A well-known example of this is the Philadelphia chromosome, or translocation of chromosomes 9 and 22, which occurs in chronic myelogenous leukemia and results in production of the BCR-abl fusion protein, an oncogenic tyrosine kinase. Small-scale mutations include point mutations, deletions, and insertions, which may occur in the promoter region of a gene and affect its expression, or may occur in the gene's coding sequence and alter the function or stability of its protein product. Disruption of a single gene may also result from integration of genomic material from a DNA virus or retrovirus, leading to the expression of viral oncogenes in the affected cell and its descendants. The transformation of a normal cell into cancer is akin to a chain reaction caused by initial errors, which compound into more severe errors, each progressively allowing the cell to escape more controls that limit normal tissue growth. This rebellion-like scenario is an undesirable survival of the fittest, where the driving forces of evolution work against the body's design and enforcement of order. Once cancer has begun to develop, this ongoing process, termed clonal evolution, drives progression towards more invasive stages. Clonal evolution leads to intra-tumour heterogeneity (cancer cells with heterogeneous mutations) that complicates designing effective treatment strategies. The classical view of cancer is a set of diseases that are driven by progressive genetic abnormalities that include mutations in tumor-suppressor genes and oncogenes and chromosomal abnormalities. Later epigenetic alterations' role was identified. Deficient expression of DNA repair proteins due to an inherited mutation can increase cancer risks. Individuals with an inherited impairment in any of 34 DNA repair genes (see article DNA repair-deficiency disorder) have increased cancer risk, with some defects ensuring a 100% lifetime chance of cancer (e.g. p53 mutations). Germ line DNA repair mutations are noted on the figure's left side. However, such germline mutations (which cause highly penetrant cancer syndromes) are the cause of only about 1 percent of cancers. In sporadic cancers, deficiencies in DNA repair are occasionally caused by a mutation in a DNA repair gene but are much more frequently caused by epigenetic alterations that reduce or silence expression of DNA repair genes. This is indicated in the figure at the 3rd level. Many studies of heavy metal-induced carcinogenesis show that such heavy metals cause a reduction in expression of DNA repair enzymes, some through epigenetic mechanisms. DNA repair inhibition is proposed to be a predominant mechanism in heavy metal-induced carcinogenicity. In addition, frequent epigenetic alterations of the DNA sequences code for small RNAs called microRNAs (or miRNAs). miRNAs do not code for proteins, but can "target" protein-coding genes and reduce their expression. Cancers usually arise from an assemblage of mutations and epimutations that confer a selective advantage leading to clonal expansion (see Field defects in progression to cancer). Mutations, however, may not be as frequent in cancers as epigenetic alterations. An average cancer of the breast or colon can have about 60 to 70 protein-altering mutations, of which about three or four may be "driver" mutations and the remaining ones may be "passenger" mutations. Blastoma: Cancers derived from immature "precursor" cells or embryonic tissue. Some types of cancer are named for the size and shape of the cells under a microscope, such as giant cell carcinoma, spindle cell carcinoma and small-cell carcinoma. Many treatment options for cancer exist. The primary ones include surgery, chemotherapy, radiation therapy, hormonal therapy, targeted therapy and palliative care. Which treatments are used depends on the type, location and grade of the cancer as well as the patient's health and preferences. The treatment intent may or may not be curative. Complementary and alternative cancer treatments are a diverse group of therapies, practices and products that are not part of conventional medicine. "Complementary medicine" refers to methods and substances used along with conventional medicine, while "alternative medicine" refers to compounds used instead of conventional medicine. Most complementary and alternative medicines for cancer have not been studied or tested using conventional techniques such as clinical trials. Some alternative treatments have been investigated and shown to be ineffective but still continue to be marketed and promoted. Cancer researcher Andrew J. Vickers stated, "The label 'unproven' is inappropriate for such therapies; it is time to assert that many alternative cancer therapies have been 'disproven'." Predicting short- or long-term survival depends on many factors. The most important are the cancer type and the patient's age and overall health. Those who are frail with other health problems have lower survival rates than otherwise healthy people. Centenarians are unlikely to survive for five years even if treatment is successful. People who report a higher quality of life tend to survive longer. People with lower quality of life may be affected by depression and other complications and/or disease progression that both impairs quality and quantity of life. Additionally, patients with worse prognoses may be depressed or report poorer quality of life because they perceive that their condition is likely to be fatal. In 2008, approximately 12.7 million cancers were diagnosed (excluding non-melanoma skin cancers and other non-invasive cancers) and in 2010 nearly 7.98 million people died. Cancers account for approximately 16% of deaths. The most common as of 2018[update] are lung cancer (1.76 million deaths), colorectal cancer (860,000) stomach cancer (780,000), liver cancer (780,000), and breast cancer (620,000). This makes invasive cancer the leading cause of death in the developed world and the second leading in the developing world. Over half of cases occur in the developing world. Deaths from cancer were 5.8 million in 1990. Deaths have been increasing primarily due to longer lifespans and lifestyle changes in the developing world. The most significant risk factor for developing cancer is age. Although it is possible for cancer to strike at any age, most patients with invasive cancer are over 65. According to cancer researcher Robert A. Weinberg, "If we lived long enough, sooner or later we all would get cancer." Some of the association between aging and cancer is attributed to immunosenescence, errors accumulated in DNA over a lifetime and age-related changes in the endocrine system. Aging's effect on cancer is complicated by factors such as DNA damage and inflammation promoting it and factors such as vascular aging and endocrine changes inhibiting it. Some slow-growing cancers are particularly common, but often are not fatal. Autopsy studies in Europe and Asia showed that up to 36% of people have undiagnosed and apparently harmless thyroid cancer at the time of their deaths and that 80% of men develop prostate cancer by age 80. As these cancers do not cause the patient's death, identifying them would have represented overdiagnosis rather than useful medical care. Cancer has existed for all of human history. The earliest written record regarding cancer is from circa 1600 BC in the Egyptian Edwin Smith Papyrus and describes breast cancer. Hippocrates (c. 460 BC – c. 370 BC) described several kinds of cancer, referring to them with the Greek word καρκίνος karkinos (crab or crayfish). This name comes from the appearance of the cut surface of a solid malignant tumor, with "the veins stretched on all sides as the animal the crab has its feet, whence it derives its name". Galen stated that "cancer of the breast is so called because of the fancied resemblance to a crab given by the lateral prolongations of the tumor and the adjacent distended veins". :738 Celsus (c. 25 BC – 50 AD) translated karkinos into the Latin cancer, also meaning crab and recommended surgery as treatment. Galen (2nd century AD) disagreed with the use of surgery and recommended purgatives instead. These recommendations largely stood for 1000 years. The physician John Hill described tobacco snuff as the cause of nose cancer in 1761. This was followed by the report in 1775 by British surgeon Percivall Pott that chimney sweeps' carcinoma, a cancer of the scrotum, was a common disease among chimney sweeps. With the widespread use of the microscope in the 18th century, it was discovered that the 'cancer poison' spread from the primary tumor through the lymph nodes to other sites ("metastasis"). This view of the disease was first formulated by the English surgeon Campbell De Morgan between 1871 and 1874. Although many diseases (such as heart failure) may have a worse prognosis than most cases of cancer, cancer is the subject of widespread fear and taboos. The euphemism of "a long illness" to describe cancers leading to death is still commonly used in obituaries, rather than naming the disease explicitly, reflecting an apparent stigma. In Nigeria, one local name for cancer translates into English as "the disease that cannot be cured". This deep belief that cancer is necessarily a difficult and usually deadly disease is reflected in the systems chosen by society to compile cancer statistics: the most common form of cancer—non-melanoma skin cancers, accounting for about one-third of cancer cases worldwide, but very few deaths—are excluded from cancer statistics specifically because they are easily treated and almost always cured, often in a single, short, outpatient procedure. Western conceptions of patients' rights for people with cancer include a duty to fully disclose the medical situation to the person, and the right to engage in shared decision-making in a way that respects the person's own values. In other cultures, other rights and values are preferred. For example, most African cultures value whole families rather than individualism. In parts of Africa, a diagnosis is commonly made so late that cure is not possible, and treatment, if available at all, would quickly bankrupt the family. As a result of these factors, African healthcare providers tend to let family members decide whether, when and how to disclose the diagnosis, and they tend to do so slowly and circuitously, as the person shows interest and an ability to cope with the grim news. People from Asian and South American countries also tend to prefer a slower, less candid approach to disclosure than is idealized in the United States and Western Europe, and they believe that sometimes it would be preferable not to be told about a cancer diagnosis. In general, disclosure of the diagnosis is more common than it was in the 20th century, but full disclosure of the prognosis is not offered to many patients around the world. In the United States and some other cultures, cancer is regarded as a disease that must be "fought" to end the "civil insurrection"; a War on Cancer was declared in the US. Military metaphors are particularly common in descriptions of cancer's human effects, and they emphasize both the state of the patient's health and the need to take immediate, decisive actions himself rather than to delay, to ignore or to rely entirely on others. The military metaphors also help rationalize radical, destructive treatments. In the 1970s, a relatively popular alternative cancer treatment in the US was a specialized form of talk therapy, based on the idea that cancer was caused by a bad attitude. People with a "cancer personality"—depressed, repressed, self-loathing and afraid to express their emotions—were believed to have manifested cancer through subconscious desire. Some psychotherapists said that treatment to change the patient's outlook on life would cure the cancer. Among other effects, this belief allowed society to blame the victim for having caused the cancer (by "wanting" it) or having prevented its cure (by not becoming a sufficiently happy, fearless and loving person). It also increased patients' anxiety, as they incorrectly believed that natural emotions of sadness, anger or fear shorten their lives. The idea was ridiculed by Susan Sontag, who published Illness as Metaphor while recovering from treatment for breast cancer in 1978. Although the original idea is now generally regarded as nonsense, the idea partly persists in a reduced form with a widespread, but incorrect, belief that deliberately cultivating a habit of positive thinking will increase survival. This notion is particularly strong in breast cancer culture. One idea about why people with cancer are blamed or stigmatized, called the just-world hypothesis, is that blaming cancer on the patient's actions or attitudes allows the blamers to regain a sense of control. This is based upon the blamers' belief that the world is fundamentally just and so any dangerous illness, like cancer, must be a type of punishment for bad choices, because in a just world, bad things would not happen to good people. Because cancer is a class of diseases, it is unlikely that there will ever be a single "cure for cancer" any more than there will be a single treatment for all infectious diseases. Angiogenesis inhibitors were once incorrectly thought to have potential as a "silver bullet" treatment applicable to many types of cancer. Angiogenesis inhibitors and other cancer therapeutics are used in combination to reduce cancer morbidity and mortality. The improved understanding of molecular biology and cellular biology due to cancer research has led to new treatments for cancer since US President Richard Nixon declared the "War on Cancer" in 1971. Since then, the country has spent over $200 billion on cancer research, including resources from public and private sectors. 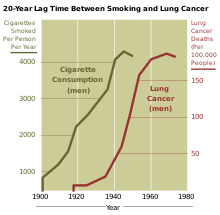 The cancer death rate (adjusting for size and age of the population) declined by five percent between 1950 and 2005. Elective abortions are not required and, for the most common forms and stages of cancer, do not improve the mother's survival. In a few instances, such as advanced uterine cancer, the pregnancy cannot be continued and in others, the patient may end the pregnancy so that she can begin aggressive chemotherapy. Some treatments can interfere with the mother's ability to give birth vaginally or to breastfeed. Cervical cancer may require birth by Caesarean section. Radiation to the breast reduces the ability of that breast to produce milk and increases the risk of mastitis. Also, when chemotherapy is given after birth, many of the drugs appear in breast milk, which could harm the baby. In non-humans, a few types of transmissible cancer have been described, wherein the cancer spreads between animals by transmission of the tumor cells themselves. This phenomenon is seen in dogs with Sticker's sarcoma (also known as canine transmissible venereal tumor), and in Tasmanian devils with devil facial tumour disease (DFTD). ^ a b c "Cancer – Signs and symptoms". NHS Choices. Archived from the original on 8 June 2014. Retrieved 10 June 2014. ^ a b c d e f g h i j k l "Cancer". World Health Organization. 12 September 2018. Retrieved 19 December 2018. ^ a b c d e f g h i Anand P, Kunnumakkara AB, Sundaram C, Harikumar KB, Tharakan ST, Lai OS, Sung B, Aggarwal BB (September 2008). "Cancer is a preventable disease that requires major lifestyle changes". Pharmaceutical Research. 25 (9): 2097–116. doi:10.1007/s11095-008-9661-9. PMC 2515569. PMID 18626751. ^ a b c National Cancer Institute (26 February 2018). "Targeted Cancer Therapies". www.cancer.gov. Retrieved 28 March 2018. ^ a b "SEER Stat Fact Sheets: All Cancer Sites". National Cancer Institute. Archived from the original on 26 September 2010. Retrieved 18 June 2014. ^ a b c d "Defining Cancer". National Cancer Institute. 17 September 2007. Retrieved 28 March 2018. ^ "Obesity and Cancer Risk". National Cancer Institute. 3 January 2012. Archived from the original on 4 July 2015. Retrieved 4 July 2015. ^ Jayasekara H, MacInnis RJ, Room R, English DR (May 2016). "Long-Term Alcohol Consumption and Breast, Upper Aero-Digestive Tract and Colorectal Cancer Risk: A Systematic Review and Meta-Analysis". Alcohol and Alcoholism. 51 (3): 315–30. doi:10.1093/alcalc/agv110. PMID 26400678. ^ "Heredity and Cancer". American Cancer Society. Archived from the original on 2 August 2013. Retrieved 22 July 2013. ^ "How is cancer diagnosed?". American Cancer Society. 29 January 2013. Archived from the original on 14 July 2014. Retrieved 10 June 2014. ^ a b c Kushi LH, Doyle C, McCullough M, Rock CL, Demark-Wahnefried W, Bandera EV, Gapstur S, Patel AV, Andrews K, Gansler T (2012). "American Cancer Society Guidelines on nutrition and physical activity for cancer prevention: reducing the risk of cancer with healthy food choices and physical activity". CA Cancer J Clin. 62 (1): 30–67. doi:10.3322/caac.20140. PMID 22237782. ^ Parkin DM, Boyd L, Walker LC (December 2011). "16. The fraction of cancer attributable to lifestyle and environmental factors in the UK in 2010". British Journal of Cancer. 105 Suppl 2: S77–81. doi:10.1038/bjc.2011.489. PMC 3252065. PMID 22158327. ^ Gøtzsche PC, Jørgensen KJ (June 2013). "Screening for breast cancer with mammography". The Cochrane Database of Systematic Reviews. 6 (6): CD001877. doi:10.1002/14651858.CD001877.pub5. PMID 23737396. ^ Dubas LE, Ingraffea A (February 2013). "Nonmelanoma skin cancer". Facial Plastic Surgery Clinics of North America. 21 (1): 43–53. doi:10.1016/j.fsc.2012.10.003. PMID 23369588. ^ Cakir BÖ, Adamson P, Cingi C (November 2012). "Epidemiology and economic burden of nonmelanoma skin cancer". Facial Plastic Surgery Clinics of North America. 20 (4): 419–22. doi:10.1016/j.fsc.2012.07.004. PMID 23084294. ^ a b c d e f g h Jemal A, Bray F, Center MM, Ferlay J, Ward E, Forman D (February 2011). "Global cancer statistics". Ca. 61 (2): 69–90. doi:10.3322/caac.20107. PMID 21296855. ^ "Cancer Glossary". cancer.org. American Cancer Society. Archived from the original on 1 September 2013. Retrieved 11 September 2013. ^ "What is cancer?". cancer.gov. National Cancer Institute. 17 September 2007. Retrieved 28 March 2018. ^ a b c d Hanahan D, Weinberg RA (January 2000). "The hallmarks of cancer". Cell. 100 (1): 57–70. doi:10.1016/S0092-8674(00)81683-9. PMID 10647931. ^ a b Hanahan D, Weinberg RA (March 2011). "Hallmarks of cancer: the next generation". Cell. 144 (5): 646–74. doi:10.1016/j.cell.2011.02.013. PMID 21376230. ^ Anguiano L, Mayer DK, Piven ML, Rosenstein D (July – August 2012). "A literature review of suicide in cancer patients". Cancer Nursing. 35 (4): E14–26. doi:10.1097/NCC.0b013e31822fc76c. PMID 21946906. ^ Islami F, Goding Sauer A, Miller KD, Siegel RL, Fedewa SA, Jacobs EJ, McCullough ML, Patel AV, Ma J, Soerjomataram I, Flanders WD, Brawley OW, Gapstur SM, Jemal A (January 2018). "Proportion and number of cancer cases and deaths attributable to potentially modifiable risk factors in the United States". Ca. 68 (1): 31–54. doi:10.3322/caac.21440. PMID 29160902. ^ Tolar J, Neglia JP (June 2003). "Transplacental and other routes of cancer transmission between individuals". Journal of Pediatric Hematology/Oncology. 25 (6): 430–4. doi:10.1097/00043426-200306000-00002. PMID 12794519. ^ Biesalski HK, Bueno de Mesquita B, Chesson A, Chytil F, Grimble R, Hermus RJ, Köhrle J, Lotan R, Norpoth K, Pastorino U, Thurnham D (1998). "European Consensus Statement on Lung Cancer: risk factors and prevention. Lung Cancer Panel". Ca. 48 (3): 167–76, discussion 164–66. doi:10.3322/canjclin.48.3.167. PMID 9594919. ^ Kuper H, Boffetta P, Adami HO (September 2002). "Tobacco use and cancer causation: association by tumour type". Journal of Internal Medicine. 252 (3): 206–24. doi:10.1046/j.1365-2796.2002.01022.x. PMID 12270001. ^ a b Kuper H, Adami HO, Boffetta P (June 2002). "Tobacco use, cancer causation and public health impact". Journal of Internal Medicine. 251 (6): 455–66. doi:10.1046/j.1365-2796.2002.00993.x. PMID 12028500. ^ Sasco AJ, Secretan MB, Straif K (August 2004). "Tobacco smoking and cancer: a brief review of recent epidemiological evidence". Lung Cancer. 45 Suppl 2: S3–9. doi:10.1016/j.lungcan.2004.07.998. PMID 15552776. ^ Thun MJ, Jemal A (October 2006). "How much of the decrease in cancer death rates in the United States is attributable to reductions in tobacco smoking?". Tobacco Control. 15 (5): 345–47. doi:10.1136/tc.2006.017749. PMC 2563648. PMID 16998161. ^ Dubey S, Powell CA (May 2008). "Update in lung cancer 2007". American Journal of Respiratory and Critical Care Medicine. 177 (9): 941–46. doi:10.1164/rccm.200801-107UP. PMC 2720127. PMID 18434333. ^ Schütze M, Boeing H, Pischon T, Rehm J, Kehoe T, Gmel G, Olsen A, Tjønneland AM, Dahm CC, Overvad K, Clavel-Chapelon F, Boutron-Ruault MC, Trichopoulou A, Benetou V, Zylis D, Kaaks R, Rohrmann S, Palli D, Berrino F, Tumino R, Vineis P, Rodríguez L, Agudo A, Sánchez MJ, Dorronsoro M, Chirlaque MD, Barricarte A, Peeters PH, van Gils CH, Khaw KT, Wareham N, Allen NE, Key TJ, Boffetta P, Slimani N, Jenab M, Romaguera D, Wark PA, Riboli E, Bergmann MM (April 2011). "Alcohol attributable burden of incidence of cancer in eight European countries based on results from prospective cohort study". BMJ. 342: d1584. doi:10.1136/bmj.d1584. PMC 3072472. PMID 21474525. ^ Irigaray P, Newby JA, Clapp R, Hardell L, Howard V, Montagnier L, Epstein S, Belpomme D (December 2007). "Lifestyle-related factors and environmental agents causing cancer: an overview". Biomedicine & Pharmacotherapy. 61 (10): 640–58. doi:10.1016/j.biopha.2007.10.006. PMID 18055160. ^ a b "WHO calls for prevention of cancer through healthy workplaces" (Press release). World Health Organization. 27 April 2007. Archived from the original on 12 October 2007. Retrieved 13 October 2007. ^ a b c Kushi LH, Byers T, Doyle C, Bandera EV, McCullough M, McTiernan A, Gansler T, Andrews KS, Thun MJ (2006). "American Cancer Society Guidelines on Nutrition and Physical Activity for cancer prevention: reducing the risk of cancer with healthy food choices and physical activity". Ca. 56 (5): 254–81, quiz 313–14. doi:10.3322/canjclin.56.5.254. PMID 17005596. ^ Bhaskaran K, Douglas I, Forbes H, dos-Santos-Silva I, Leon DA, Smeeth L (August 2014). "Body-mass index and risk of 22 specific cancers: a population-based cohort study of 5·24 million UK adults". Lancet. 384 (9945): 755–65. doi:10.1016/S0140-6736(14)60892-8. PMC 4151483. PMID 25129328. ^ a b c Park S, Bae J, Nam BH, Yoo KY (2008). "Aetiology of cancer in Asia". Asian Pacific Journal of Cancer Prevention. 9 (3): 371–80. PMID 18990005. Archived from the original (PDF) on 4 September 2011. ^ Buell P, Dunn JE (May 1965). "Cancer Mortality Among Japanese Issei and Nisei of California". Cancer. 18 (5): 656–64. doi:10.1002/1097-0142(196505)18:5<656::AID-CNCR2820180515>3.0.CO;2-3. PMID 14278899. ^ Pagano JS, Blaser M, Buendia MA, Damania B, Khalili K, Raab-Traub N, Roizman B (December 2004). "Infectious agents and cancer: criteria for a causal relation". Seminars in Cancer Biology. 14 (6): 453–71. Bibcode:2004SCB....16...13G. doi:10.1016/j.semcancer.2004.06.009. PMID 15489139. ^ Ljubojevic S, Skerlev M (2014). "HPV-associated diseases". Clinics in Dermatology. 32 (2): 227–34. doi:10.1016/j.clindermatol.2013.08.007. PMID 24559558. ^ Samaras V, Rafailidis PI, Mourtzoukou EG, Peppas G, Falagas ME (June 2010). "Chronic bacterial and parasitic infections and cancer: a review" (PDF). Journal of Infection in Developing Countries. 4 (5): 267–81. doi:10.3855/jidc.819. PMID 20539059. Archived from the original on 4 October 2011. ^ a b c d e Little JB (2000). "Chapter 14: Ionizing Radiation". In Kufe DW, Pollock RE, Weichselbaum RR, Bast RC, Gansler TS, Holland JF, Frei E (eds.). Cancer medicine (6th ed.). Hamilton, Ont: B.C. Decker. ISBN 978-1-55009-113-7. Archived from the original on 2 January 2016. ^ Brenner DJ, Hall EJ (November 2007). 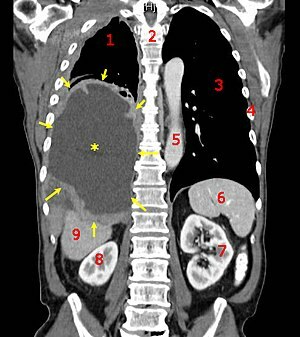 "Computed tomography—an increasing source of radiation exposure". The New England Journal of Medicine. 357 (22): 2277–84. doi:10.1056/NEJMra072149. PMID 18046031. ^ a b Cleaver JE, Mitchell DL (2000). "15. Ultraviolet Radiation Carcinogenesis". In Bast RC, Kufe DW, Pollock RE, et al. (eds.). Holland-Frei Cancer Medicine (5th ed.). Hamilton, Ontario: B.C. Decker. ISBN 978-1-55009-113-7. Archived from the original on 4 September 2015. Retrieved 31 January 2011. ^ "IARC classifies radiofrequency electromagnetic fields as possibly carcinogenic to humans" (PDF). World Health Organization. Archived (PDF) from the original on 1 June 2011. ^ "Cell Phones and Cancer Risk – National Cancer Institute". Cancer.gov. 8 May 2013. Retrieved 28 March 2018. ^ a b Roukos DH (April 2009). "Genome-wide association studies: how predictable is a person's cancer risk?". Expert Review of Anticancer Therapy. 9 (4): 389–92. doi:10.1586/era.09.12. PMID 19374592. ^ Cunningham D, Atkin W, Lenz HJ, Lynch HT, Minsky B, Nordlinger B, Starling N (March 2010). "Colorectal cancer". Lancet. 375 (9719): 1030–47. doi:10.1016/S0140-6736(10)60353-4. PMID 20304247. ^ Kampman, E. (2007). "A First-Degree Relative with Colorectal Cancer: What Are We Missing?". Cancer Epidemiology, Biomarkers & Prevention. 16 (1): 1–3. doi:10.1158/1055-9965.EPI-06-0984. ISSN 1055-9965. PMID 17220324. ^ Coté ML, Liu M, Bonassi S, Neri M, Schwartz AG, Christiani DC, et al. (September 2012). "Increased risk of lung cancer in individuals with a family history of the disease: a pooled analysis from the International Lung Cancer Consortium". European Journal of Cancer. 48 (13): 1957–68. doi:10.1016/j.ejca.2012.01.038. PMC 3445438. PMID 22436981. ^ Bruner DW, Moore D, Parlanti A, Dorgan J, Engstrom P (December 2003). "Relative risk of prostate cancer for men with affected relatives: systematic review and meta-analysis". International Journal of Cancer. 107 (5): 797–803. doi:10.1002/ijc.11466. PMID 14566830. ^ Singletary, S. Eva (2003). "Rating the Risk Factors for Breast Cancer". Annals of Surgery. 237 (4): 474–82. doi:10.1097/01.SLA.0000059969.64262.87. ISSN 0003-4932. PMC 1514477. PMID 12677142. ^ Green J, Cairns BJ, Casabonne D, Wright FL, Reeves G, Beral V (August 2011). "Height and cancer incidence in the Million Women Study: prospective cohort, and meta-analysis of prospective studies of height and total cancer risk". The Lancet. Oncology. 12 (8): 785–94. doi:10.1016/S1470-2045(11)70154-1. PMC 3148429. PMID 21782509. ^ a b c d e Maltoni CF, Holland JF (2000). "Chapter 16: Physical Carcinogens". In Bast RC, Kufe DW, Pollock RE, et al. (eds.). Holland-Frei Cancer Medicine (5th ed.). Hamilton, Ontario: B.C. Decker. ISBN 978-1-55009-113-7. Archived from the original on 4 September 2015. Retrieved 31 January 2011. ^ a b c d e f g Gaeta JF (2000). "Chapter 17: Trauma and Inflammation". In Bast RC, Kufe DW, Pollock RE, et al. (eds.). Holland-Frei Cancer Medicine (5th ed.). Hamilton, Ontario: B.C. Decker. ISBN 978-1-55009-113-7. Archived from the original on 4 September 2015. Retrieved 27 January 2011. ^ Colotta F, Allavena P, Sica A, Garlanda C, Mantovani A (July 2009). "Cancer-related inflammation, the seventh hallmark of cancer: links to genetic instability". Carcinogenesis (review). 30 (7): 1073–81. doi:10.1093/carcin/bgp127. PMID 19468060. ^ Ungefroren H, Sebens S, Seidl D, Lehnert H, Hass R (September 2011). "Interaction of tumor cells with the microenvironment". Cell Communication and Signaling. 9 (18): 18. doi:10.1186/1478-811X-9-18. PMC 3180438. PMID 21914164. Archived from the original on 22 February 2014. ^ Mantovani A (June 2010). "Molecular pathways linking inflammation and cancer". Current Molecular Medicine (review). 10 (4): 369–73. doi:10.2174/156652410791316968. PMID 20455855. ^ Borrello MG, Degl'Innocenti D, Pierotti MA (August 2008). "Inflammation and cancer: the oncogene-driven connection". Cancer Letters (review). 267 (2): 262–70. doi:10.1016/j.canlet.2008.03.060. PMID 18502035. ^ a b c d e f g h i j Henderson BE, Bernstein L, Ross RK (2000). "Chapter 13: Hormones and the Etiology of Cancer". In Bast RC, Kufe DW, Pollock RE, et al. (eds.). Holland-Frei Cancer Medicine (5th ed.). Hamilton, Ontario: B.C. Decker. ISBN 978-1-55009-113-7. Archived from the original on 10 September 2017. Retrieved 27 January 2011. ^ Rowlands MA, Gunnell D, Harris R, Vatten LJ, Holly JM, Martin RM (May 2009). "Circulating insulin-like growth factor peptides and prostate cancer risk: a systematic review and meta-analysis". International Journal of Cancer. 124 (10): 2416–29. doi:10.1002/ijc.24202. PMC 2743036. PMID 19142965. ^ Han Y, Chen W, Li P, Ye J (September 2015). "Association Between Coeliac Disease and Risk of Any Malignancy and Gastrointestinal Malignancy: A Meta-Analysis". Medicine. 94 (38): e1612. doi:10.1097/MD.0000000000001612. PMC 4635766. PMID 26402826. ^ Axelrad JE, Lichtiger S, Yajnik V (May 2016). "Inflammatory bowel disease and cancer: The role of inflammation, immunosuppression, and cancer treatment". World Journal of Gastroenterology. 22 (20): 4794–801. doi:10.3748/wjg.v22.i20.4794. PMC 4873872. PMID 27239106. ^ Croce CM (January 2008). "Oncogenes and cancer". The New England Journal of Medicine. 358 (5): 502–11. doi:10.1056/NEJMra072367. PMID 18234754. ^ Knudson AG (November 2001). "Two genetic hits (more or less) to cancer". Nature Reviews. Cancer. 1 (2): 157–62. doi:10.1038/35101031. PMID 11905807. ^ Nelson DA, Tan TT, Rabson AB, Anderson D, Degenhardt K, White E (September 2004). "Hypoxia and defective apoptosis drive genomic instability and tumorigenesis". Genes & Development. 18 (17): 2095–107. doi:10.1101/gad.1204904. PMC 515288. PMID 15314031. ^ Merlo LM, Pepper JW, Reid BJ, Maley CC (December 2006). "Cancer as an evolutionary and ecological process". Nature Reviews. Cancer. 6 (12): 924–35. doi:10.1038/nrc2013. PMID 17109012. ^ Baylin SB, Ohm JE (February 2006). "Epigenetic gene silencing in cancer – a mechanism for early oncogenic pathway addiction?". Nature Reviews. Cancer. 6 (2): 107–16. doi:10.1038/nrc1799. PMID 16491070. ^ Kanwal R, Gupta S (April 2012). "Epigenetic modifications in cancer". Clinical Genetics. 81 (4): 303–11. doi:10.1111/j.1399-0004.2011.01809.x. PMC 3590802. PMID 22082348. ^ Schnekenburger M, Diederich M (March 2012). "Epigenetics Offer New Horizons for Colorectal Cancer Prevention". Current Colorectal Cancer Reports. 8 (1): 66–81. doi:10.1007/s11888-011-0116-z. PMC 3277709. PMID 22389639. ^ Jacinto FV, Esteller M (July 2007). "Mutator pathways unleashed by epigenetic silencing in human cancer". Mutagenesis. 22 (4): 247–53. doi:10.1093/mutage/gem009. PMID 17412712. Archived from the original on 4 September 2015. ^ Lahtz C, Pfeifer GP (February 2011). "Epigenetic changes of DNA repair genes in cancer". Journal of Molecular Cell Biology. 3 (1): 51–8. doi:10.1093/jmcb/mjq053. PMC 3030973. PMID 21278452. Archived from the original on 16 October 2015. ^ Bernstein C, Nfonsam V, Prasad AR, Bernstein H (March 2013). "Epigenetic field defects in progression to cancer". World Journal of Gastrointestinal Oncology. 5 (3): 43–49. doi:10.4251/wjgo.v5.i3.43. PMC 3648662. PMID 23671730. Archived from the original on 15 December 2013. ^ Bernstein C, Prasad AR, Nfonsam V, Bernstein H (2013). "DNA Damage, DNA Repair and Cancer". In Chen C (ed.). New Research Directions in DNA Repair. InTech. doi:10.5772/53919. ISBN 978-953-51-1114-6. Archived from the original on 24 September 2015. ^ Narayanan L, Fritzell JA, Baker SM, Liskay RM, Glazer PM (April 1997). "Elevated levels of mutation in multiple tissues of mice deficient in the DNA mismatch repair gene Pms2". Proceedings of the National Academy of Sciences of the United States of America. 94 (7): 3122–27. Bibcode:1997PNAS...94.3122N. doi:10.1073/pnas.94.7.3122. PMC 20332. PMID 9096356. ^ Hegan DC, Narayanan L, Jirik FR, Edelmann W, Liskay RM, Glazer PM (December 2006). "Differing patterns of genetic instability in mice deficient in the mismatch repair genes Pms2, Mlh1, Msh2, Msh3 and Msh6". Carcinogenesis. 27 (12): 2402–08. doi:10.1093/carcin/bgl079. PMC 2612936. PMID 16728433. ^ Tutt AN, van Oostrom CT, Ross GM, van Steeg H, Ashworth A (March 2002). "Disruption of Brca2 increases the spontaneous mutation rate in vivo: synergism with ionizing radiation". EMBO Reports. 3 (3): 255–60. doi:10.1093/embo-reports/kvf037. PMC 1084010. PMID 11850397. ^ German J (March 1969). "Bloom's syndrome. I. Genetical and clinical observations in the first twenty-seven patients". American Journal of Human Genetics. 21 (2): 196–227. PMC 1706430. PMID 5770175. ^ O'Hagan HM, Mohammad HP, Baylin SB (August 2008). Lee JT (ed.). "Double strand breaks can initiate gene silencing and SIRT1-dependent onset of DNA methylation in an exogenous promoter CpG island". PLoS Genetics. 4 (8): e1000155. doi:10.1371/journal.pgen.1000155. PMC 2491723. PMID 18704159. ^ Cuozzo C, Porcellini A, Angrisano T, Morano A, Lee B, Di Pardo A, Messina S, Iuliano R, Fusco A, Santillo MR, Muller MT, Chiariotti L, Gottesman ME, Avvedimento EV (July 2007). 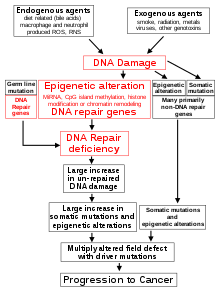 "DNA damage, homology-directed repair, and DNA methylation". PLoS Genetics. 3 (7): e110. doi:10.1371/journal.pgen.0030110. PMC 1913100. PMID 17616978. ^ Malkin D (April 2011). "Li-fraumeni syndrome". Genes & Cancer. 2 (4): 475–84. doi:10.1177/1947601911413466. PMC 3135649. PMID 21779515. ^ Fearon ER (November 1997). "Human cancer syndromes: clues to the origin and nature of cancer". Science. 278 (5340): 1043–50. Bibcode:1997Sci...278.1043F. doi:10.1126/science.278.5340.1043. PMID 9353177. ^ Vogelstein B, Papadopoulos N, Velculescu VE, Zhou S, Diaz LA, Kinzler KW (March 2013). "Cancer genome landscapes". Science. 339 (6127): 1546–58. Bibcode:2013Sci...339.1546V. doi:10.1126/science.1235122. PMC 3749880. PMID 23539594. ^ a b "Metastatic Cancer: Questions and Answers". National Cancer Institute. 12 May 2015. Retrieved 28 March 2018. ^ "What is Metastasized Cancer?". National Comprehensive Cancer Network. Archived from the original on 7 July 2013. Retrieved 18 July 2013. ^ "Cancer prevention: 7 steps to reduce your risk". Mayo Clinic. 27 September 2008. Archived from the original on 8 February 2010. Retrieved 30 January 2010. ^ Danaei G, Vander Hoorn S, Lopez AD, Murray CJ, Ezzati M (November 2005). "Causes of cancer in the world: comparative risk assessment of nine behavioural and environmental risk factors". Lancet. 366 (9499): 1784–93. doi:10.1016/S0140-6736(05)67725-2. PMID 16298215. ^ Wu S, Powers S, Zhu W, Hannun YA (January 2016). "Substantial contribution of extrinsic risk factors to cancer development". Nature. 529 (7584): 43–7. Bibcode:2016Natur.529...43W. doi:10.1038/nature16166. PMC 4836858. PMID 26675728. ^ "Cancer". World Health Organization. Archived from the original on 29 December 2010. Retrieved 9 January 2011. ^ a b Wicki A, Hagmann J (September 2011). "Diet and cancer". Swiss Medical Weekly. 141: w13250. doi:10.4414/smw.2011.13250. PMID 21904992. ^ Cappellani A, Di Vita M, Zanghi A, Cavallaro A, Piccolo G, Veroux M, Berretta M, Malaguarnera M, Canzonieri V, Lo Menzo E (January 2012). "Diet, obesity and breast cancer: an update". Frontiers in Bioscience. 4: 90–108. doi:10.2741/253. PMID 22202045. ^ Key TJ (January 2011). "Fruit and vegetables and cancer risk". British Journal of Cancer. 104 (1): 6–11. doi:10.1038/sj.bjc.6606032. PMC 3039795. PMID 21119663. ^ Wang X, Ouyang Y, Liu J, Zhu M, Zhao G, Bao W, Hu FB (July 2014). "Fruit and vegetable consumption and mortality from all causes, cardiovascular disease, and cancer: systematic review and dose-response meta-analysis of prospective cohort studies". BMJ. 349: g4490. doi:10.1136/bmj.g4490. PMC 4115152. PMID 25073782. ^ Larsson SC, Wolk A (May 2007). "Coffee consumption and risk of liver cancer: a meta-analysis". Gastroenterology. 132 (5): 1740–5. doi:10.1053/j.gastro.2007.03.044. PMID 17484871. ^ Zheng W, Lee SA (2009). "Well-done meat intake, heterocyclic amine exposure, and cancer risk". Nutrition and Cancer. 61 (4): 437–46. doi:10.1080/01635580802710741. PMC 2769029. PMID 19838915. ^ Ferguson LR (February 2010). "Meat and cancer". Meat Science. 84 (2): 308–13. doi:10.1016/j.meatsci.2009.06.032. PMID 20374790. ^ Staff (26 October 2015). "World Health Organization – IARC Monographs evaluate consumption of red meat and processed meat" (PDF). International Agency for Research on Cancer. Archived (PDF) from the original on 26 October 2015. Retrieved 26 October 2015. ^ Hauser, Christine (26 October 2015). "W.H.O. Report Links Some Cancers With Processed or Red Meat". The New York Times. Archived from the original on 26 October 2015. Retrieved 26 October 2015. ^ Rostom A, Dubé C, Lewin G, Tsertsvadze A, Barrowman N, Code C, Sampson M, Moher D (March 2007). "Nonsteroidal anti-inflammatory drugs and cyclooxygenase-2 inhibitors for primary prevention of colorectal cancer: a systematic review prepared for the U.S. Preventive Services Task Force". Annals of Internal Medicine. 146 (5): 376–89. doi:10.7326/0003-4819-146-5-200703060-00010. PMID 17339623. ^ Rothwell PM, Fowkes FG, Belch JF, Ogawa H, Warlow CP, Meade TW (January 2011). "Effect of daily aspirin on long-term risk of death due to cancer: analysis of individual patient data from randomised trials". Lancet. 377 (9759): 31–41. doi:10.1016/S0140-6736(10)62110-1. PMID 21144578. ^ Cooper K, Squires H, Carroll C, Papaioannou D, Booth A, Logan RF, Maguire C, Hind D, Tappenden P (June 2010). "Chemoprevention of colorectal cancer: systematic review and economic evaluation". Health Technology Assessment. 14 (32): 1–206. doi:10.3310/hta14320. PMID 20594533. ^ Thomsen A, Kolesar JM (December 2008). "Chemoprevention of breast cancer". American Journal of Health-System Pharmacy. 65 (23): 2221–28. doi:10.2146/ajhp070663. PMID 19020189. ^ Wilt TJ, MacDonald R, Hagerty K, Schellhammer P, Kramer BS (April 2008). Wilt TJ (ed.). "Five-alpha-reductase Inhibitors for prostate cancer prevention". The Cochrane Database of Systematic Reviews (2): CD007091. doi:10.1002/14651858.CD007091. PMID 18425978. ^ "Vitamins and minerals: not for cancer or cardiovascular prevention". Prescrire International. 19 (108): 182. August 2010. PMID 20939459. Archived from the original on 25 May 2012. ^ Giovannucci E, Liu Y, Rimm EB, Hollis BW, Fuchs CS, Stampfer MJ, Willett WC (April 2006). "Prospective study of predictors of vitamin D status and cancer incidence and mortality in men". Journal of the National Cancer Institute. 98 (7): 451–59. doi:10.1093/jnci/djj101. PMID 16595781. ^ "Vitamin D Has Role in Colon Cancer Prevention". Archived from the original on 4 December 2006. Retrieved 27 July 2007. ^ Holick MF (January 2013). "Vitamin D, sunlight and cancer connection". Anti-Cancer Agents in Medicinal Chemistry. 13 (1): 70–82. doi:10.2174/187152013804487308. PMID 23094923. ^ Schwartz GG, Blot WJ (April 2006). "Vitamin D status and cancer incidence and mortality: something new under the sun". Journal of the National Cancer Institute. 98 (7): 428–30. doi:10.1093/jnci/djj127. PMID 16595770. ^ a b Bolland MJ, Grey A, Gamble GD, Reid IR (April 2014). "The effect of vitamin D supplementation on skeletal, vascular, or cancer outcomes: a trial sequential meta-analysis". The Lancet. Diabetes & Endocrinology. 2 (4): 307–20. doi:10.1016/S2213-8587(13)70212-2. PMID 24703049. ^ Bjelakovic G, Gluud LL, Nikolova D, Whitfield K, Wetterslev J, Simonetti RG, Bjelakovic M, Gluud C (January 2014). "Vitamin D supplementation for prevention of mortality in adults". The Cochrane Database of Systematic Reviews. 1 (1): CD007470. doi:10.1002/14651858.cd007470.pub3. PMID 24414552. ^ Fritz H, Kennedy D, Fergusson D, Fernandes R, Doucette S, Cooley K, Seely A, Sagar S, Wong R, Seely D (2011). Minna JD (ed.). "Vitamin A and retinoid derivatives for lung cancer: a systematic review and meta analysis". PLOS ONE. 6 (6): e21107. Bibcode:2011PLoSO...6E1107F. doi:10.1371/journal.pone.0021107. PMC 3124481. PMID 21738614. ^ Cole BF, Baron JA, Sandler RS, Haile RW, Ahnen DJ, Bresalier RS, McKeown-Eyssen G, Summers RW, Rothstein RI, Burke CA, Snover DC, Church TR, Allen JI, Robertson DJ, Beck GJ, Bond JH, Byers T, Mandel JS, Mott LA, Pearson LH, Barry EL, Rees JR, Marcon N, Saibil F, Ueland PM, Greenberg ER (June 2007). "Folic acid for the prevention of colorectal adenomas: a randomized clinical trial". JAMA. 297 (21): 2351–59. doi:10.1001/jama.297.21.2351. PMID 17551129. ^ Vinceti M, Dennert G, Crespi CM, Zwahlen M, Brinkman M, Zeegers MP, Horneber M, D'Amico R, Del Giovane C (March 2014). "Selenium for preventing cancer". The Cochrane Database of Systematic Reviews. 3 (3): CD005195. doi:10.1002/14651858.CD005195.pub3. PMC 4441528. PMID 24683040. ^ a b c "Cancer Vaccine Fact Sheet". NCI. 8 June 2006. Retrieved 28 March 2018. ^ a b Lertkhachonsuk AA, Yip CH, Khuhaprema T, Chen DS, Plummer M, Jee SH, Toi M, Wilailak S (November 2013). "Cancer prevention in Asia: resource-stratified guidelines from the Asian Oncology Summit 2013". The Lancet. Oncology. 14 (12): e497–507. arXiv:cond-mat/0606434. doi:10.1016/S1470-2045(13)70350-4. PMID 24176569. ^ a b c "Cancer Screening Overview (PDQ®)–Patient Version". National Cancer Institute. 13 January 2010. Retrieved 28 March 2018. ^ "Screening for Cervical Cancer". U.S. Preventive Services Task Force. 2003. Archived from the original on 23 December 2010. ^ "Screening for Colorectal Cancer". U.S. Preventive Services Task Force. 2008. Archived from the original on 7 February 2015. ^ "Screening for Skin Cancer". U.S. Preventive Services Task Force. 2009. Archived from the original on 8 January 2011. ^ "Screening for Oral Cancer". U.S. Preventive Services Task Force. 2004. Archived from the original on 24 October 2010. ^ "Lung Cancer Screening". U.S. Preventive Services Task Force. 2004. Archived from the original on 4 November 2010. ^ "Screening for Prostate Cancer". U.S. Preventive Services Task Force. 2008. Archived from the original on 31 December 2010. ^ "Screening for Bladder Cancer". U.S. Preventive Services Task Force. 2004. Archived from the original on 23 August 2010. ^ "Screening for Testicular Cancer". U.S. Preventive Services Task Force. 2004. Archived from the original on 15 May 2016. ^ "Screening for Ovarian Cancer". U.S. Preventive Services Task Force. 2004. Archived from the original on 23 October 2010. ^ "Screening for Pancreatic Cancer". U.S. Preventive Services Task Force. 2004. Archived from the original on 21 November 2010. ^ Chou R, Croswell JM, Dana T, Bougatous C, Blazina I, Fu R, Gleitsmann K, Koenig HC, et al. (7 October 2011). "Screening for Prostate Cancer: A Review of the Evidence for the U.S. Preventive Services Task Force". United States Preventive Services Task Force. Archived from the original on 11 October 2011. Retrieved 8 October 2011. ^ "Screening for Breast Cancer". U.S. Preventive Services Task Force. 2009. Archived from the original on 2 January 2013. ^ Gøtzsche PC, Jørgensen KJ (June 2013). "Screening for breast cancer with mammography". The Cochrane Database of Systematic Reviews (6): CD001877. doi:10.1002/14651858.CD001877.pub5. PMID 23737396. ^ a b Gulati AP, Domchek SM (January 2008). "The clinical management of BRCA1 and BRCA2 mutation carriers". Current Oncology Reports. 10 (1): 47–53. doi:10.1007/s11912-008-0008-9. PMID 18366960. ^ Lind MJ (2008). "Principles of cytotoxic chemotherapy". Medicine. 36 (1): 19–23. doi:10.1016/j.mpmed.2007.10.003. ^ "Targeted Cancer Therapies". About Cancer. National Cancer Institute. 26 February 2018. Retrieved 28 March 2018. ^ Nastoupil LJ, Rose AC, Flowers CR (May 2012). "Diffuse large B-cell lymphoma: current treatment approaches". Oncology. 26 (5): 488–95. PMID 22730604. ^ Freedman A (October 2012). "Follicular lymphoma: 2012 update on diagnosis and management". American Journal of Hematology. 87 (10): 988–95. doi:10.1002/ajh.23313. PMID 23001911. ^ Rampling R, James A, Papanastassiou V (June 2004). "The present and future management of malignant brain tumours: surgery, radiotherapy, chemotherapy". Journal of Neurology, Neurosurgery, and Psychiatry. 75 Suppl 2 (Suppl 2): ii24–30. doi:10.1136/jnnp.2004.040535. PMC 1765659. PMID 15146036. ^ Madan V, Lear JT, Szeimies RM (February 2010). "Non-melanoma skin cancer". Lancet. 375 (9715): 673–85. doi:10.1016/S0140-6736(09)61196-X. PMC 3339125. PMID 20171403. ^ Prince, Jim McMorran, Damian Crowther, Stew McMorran, Steve Youngmin, Ian Wacogne, Jon Pleat, Clive. "tumour radiosensitivity – General Practice Notebook". Archived from the original on 24 September 2015. ^ Hill R, Healy B, Holloway L, Kuncic Z, Thwaites D, Baldock C (March 2014). "Advances in kilovoltage x-ray beam dosimetry". Physics in Medicine and Biology. 59 (6): R183–231. Bibcode:2014PMB....59R.183H. doi:10.1088/0031-9155/59/6/r183. PMID 24584183.
for lung cancer, see Azzoli CG, Temin S, Aliff T, Baker S, Brahmer J, Johnson DH, Laskin JL, Masters G, Milton D, Nordquist L, Pao W, Pfister DG, Piantadosi S, Schiller JH, Smith R, Smith TJ, Strawn JR, Trent D, Giaccone G (October 2011). "2011 Focused Update of 2009 American Society of Clinical Oncology Clinical Practice Guideline Update on Chemotherapy for Stage IV Non-Small-Cell Lung Cancer". Journal of Clinical Oncology. 29 (28): 3825–31. doi:10.1200/JCO.2010.34.2774. PMC 3675703. PMID 21900105. and Ettinger DS, Akerley W, Bepler G, Blum MG, Chang A, Cheney RT, et al. (July 2010). 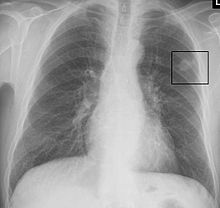 "Non-small cell lung cancer". Journal of the National Comprehensive Cancer Network. 8 (7): 740–801. PMID 20679538.
for breast cancer, see Carlson RW, Allred DC, Anderson BO, Burstein HJ, Carter WB, Edge SB, et al. (February 2009). "Breast cancer. Clinical practice guidelines in oncology". Journal of the National Comprehensive Cancer Network. 7 (2): 122–92. PMID 19200416.
for colon cancer, see Engstrom PF, Arnoletti JP, Benson AB, Chen YJ, Choti MA, Cooper HS, Covey A, Dilawari RA, Early DS, Enzinger PC, Fakih MG, Fleshman J, Fuchs C, Grem JL, Kiel K, Knol JA, Leong LA, Lin E, Mulcahy MF, Rao S, Ryan DP, Saltz L, Shibata D, Skibber JM, Sofocleous C, Thomas J, Venook AP, Willett C (September 2009). "NCCN Clinical Practice Guidelines in Oncology: colon cancer". Journal of the National Comprehensive Cancer Network. 7 (8): 778–831. PMID 19755046.
for other general statements see Smith TJ, Hillner BE (May 2011). "Bending the cost curve in cancer care". The New England Journal of Medicine. 364 (21): 2060–5. doi:10.1056/NEJMsb1013826. PMC 4042405. PMID 21612477. and Peppercorn JM, Smith TJ, Helft PR, Debono DJ, Berry SR, Wollins DS, Hayes DM, Von Roenn JH, Schnipper LE (February 2011). "American society of clinical oncology statement: toward individualized care for patients with advanced cancer". Journal of Clinical Oncology. 29 (6): 755–60. doi:10.1200/JCO.2010.33.1744. PMID 21263086. ^ "NCCN Guidelines". Archived from the original on 14 May 2008. ^ "Clinical Practice Guidelines for Quality Palliative Care" (PDF). The National Consensus Project for Quality Palliative Care (NCP). Archived from the original (PDF) on 16 May 2011. ^ Levy MH, Back A, Bazargan S, Benedetti C, Billings JA, Block S, Bruera E, Carducci MA, Dy S, Eberle C, Foley KM, Harris JD, Knight SJ, Milch R, Rhiner M, Slatkin NE, Spiegel D, Sutton L, Urba S, Von Roenn JH, Weinstein SM (September 2006). "Palliative care. Clinical practice guidelines in oncology". Journal of the National Comprehensive Cancer Network. 4 (8): 776–818. PMID 16948956. ^ "Lasers in Cancer Treatment". National Institutes of Health, National Cancer Institute. 13 September 2011. Retrieved 15 December 2017. This article incorporates text from this source, which is in the public domain. ^ Cassileth BR, Deng G (2004). "Complementary and alternative therapies for cancer". The Oncologist. 9 (1): 80–89. doi:10.1634/theoncologist.9-1-80. PMID 14755017. ^ Vickers A (2004). "Alternative cancer cures: "unproven" or "disproven"?". Ca. 54 (2): 110–18. CiteSeerX 10.1.1.521.2180. doi:10.3322/canjclin.54.2.110. PMID 15061600. ^ a b Rheingold S, Neugut A, Meadows A (2003). "156: Secondary Cancers: Incidence, Risk Factors, and Management". In Frei E, Kufe DW, Holland JF (eds.). Holland-Frei Cancer Medicine (6th ed.). Hamilton, Ont: BC Decker. p. 2399. ISBN 978-1-55009-213-4. ^ Montazeri A (December 2009). "Quality of life data as prognostic indicators of survival in cancer patients: an overview of the literature from 1982 to 2008". Health and Quality of Life Outcomes. 7: 102. doi:10.1186/1477-7525-7-102. PMC 2805623. PMID 20030832. ^ Akl EA, Kahale LA, Ballout RA, Barba M, Yosuico VE, van Doormaal FF, Middeldorp S, Bryant A, Schünemann H (December 2014). "Parenteral anticoagulation in ambulatory patients with cancer". The Cochrane Database of Systematic Reviews. 12 (12): CD006652. doi:10.1002/14651858.CD006652.pub4. PMID 25491949. ^ a b "Latest global cancer data: Cancer burden rises to 18.1 million new cases and 9.6 million cancer deaths in 2018" (PDF). www.iarc.fr. Retrieved 5 December 2018. ^ a b Lozano R, Naghavi M, Foreman K, Lim S, Shibuya K, Aboyans V, et al. (December 2012). "Global and regional mortality from 235 causes of death for 20 age groups in 1990 and 2010: a systematic analysis for the Global Burden of Disease Study 2010". Lancet. 380 (9859): 2095–128. doi:10.1016/S0140-6736(12)61728-0. hdl:10536/DRO/DU:30050819. PMID 23245604. ^ a b Coleman WB, Rubinas TC (2009). "4". In Tsongalis GJ, Coleman WL (eds.). Molecular Pathology: The Molecular Basis of Human Disease. Amsterdam: Elsevier Academic Press. p. 66. ISBN 978-0-12-374419-7. ^ Johnson G (28 December 2010). "Unearthing Prehistoric Tumors, and Debate". The New York Times. Archived from the original on 24 June 2017. ^ Pawelec G, Derhovanessian E, Larbi A (August 2010). "Immunosenescence and cancer". Critical Reviews in Oncology/Hematology. 75 (2): 165–72. doi:10.1016/j.critrevonc.2010.06.012. PMID 20656212. ^ Alberts B, Johnson A, Lewis J, et al. (2002). "The Preventable Causes of Cancer". Molecular biology of the cell (4th ed.). New York: Garland Science. ISBN 978-0-8153-4072-0. Archived from the original on 2 January 2016. A certain irreducible background incidence of cancer is to be expected regardless of circumstances: mutations can never be absolutely avoided, because they are an inescapable consequence of fundamental limitations on the accuracy of DNA replication, as discussed in Chapter 5. If a human could live long enough, it is inevitable that at least one of his or her cells would eventually accumulate a set of mutations sufficient for cancer to develop. ^ Anisimov VN, Sikora E, Pawelec G (August 2009). "Relationships between cancer and aging: a multilevel approach". Biogerontology. 10 (4): 323–38. doi:10.1007/s10522-008-9209-8. PMID 19156531. ^ de Magalhães JP (May 2013). "How ageing processes influence cancer". Nature Reviews. Cancer. 13 (5): 357–65. doi:10.1038/nrc3497. PMID 23612461. ^ a b Kaatsch P (June 2010). "Epidemiology of childhood cancer". Cancer Treatment Reviews. 36 (4): 277–85. doi:10.1016/j.ctrv.2010.02.003. PMID 20231056. ^ a b Ward E, DeSantis C, Robbins A, Kohler B, Jemal A (January 2014). "Childhood and adolescent cancer statistics, 2014". Ca. 64 (2): 83–103. doi:10.3322/caac.21219. PMID 24488779. ^ Ward EM, Thun MJ, Hannan LM, Jemal A (September 2006). "Interpreting cancer trends". Annals of the New York Academy of Sciences. 1076 (1): 29–53. Bibcode:2006NYASA1076...29W. doi:10.1196/annals.1371.048. PMID 17119192. ^ a b c d e f Hajdu SI (March 2011). "A note from history: landmarks in history of cancer, part 1". Cancer. 117 (5): 1097–102. doi:10.1002/cncr.25553. PMID 20960499. ^ Paul of Aegina, 7th Century AD, quoted in Moss, Ralph W. (2004). "Galen on Cancer". CancerDecisions. Archived from the original on 16 July 2011. Referenced from Michael Shimkin, Contrary to Nature, Washington, DC: Superintendent of Document, DHEW Publication No. (NIH) 79–720, p. 35. ^ a b Hajdu SI (June 2011). "A note from history: landmarks in history of cancer, part 2". Cancer. 117 (12): 2811–20. doi:10.1002/cncr.25825. PMID 21656759. ^ Hajdu SI (February 2012). "A note from history: landmarks in history of cancer, part 3". Cancer. 118 (4): 1155–68. doi:10.1002/cncr.26320. PMID 21751192. ^ Grange JM, Stanford JL, Stanford CA (June 2002). "Campbell De Morgan's 'Observations on cancer', and their relevance today". Journal of the Royal Society of Medicine. 95 (6): 296–99. doi:10.1258/jrsm.95.6.296. PMC 1279913. PMID 12042378. ^ Ehrenreich, Barbara (November 2001). "Welcome to Cancerland". Harper's Magazine. ISSN 0017-789X. Archived from the original on 8 November 2013. ^ "Skin cancers". World Health Organization. Archived from the original on 27 September 2010. Retrieved 19 January 2011. ^ Low G, Cameron L (1999). "10". Researching and Applying Metaphor. Cambridge University Press. ISBN 978-0-521-64964-3. ^ Sulik, Gayle A. (2010). Pink Ribbon Blues: How Breast Cancer Culture Undermines Women's Health. Oxford University Press. pp. 78–89. ISBN 978-0-19-974993-5. ^ a b c Olson JS (2005). Bathsheba's Breast: Women, Cancer, and History. JHU Press. pp. 145–70. ISBN 978-0-8018-8064-3. OCLC 186453370. ^ Huff C (24 September 2013). "A Sick Stigma: Why are cancer patients blamed for their illness?". Slate. Archived from the original on 11 October 2013. ^ "Economic Impact of Cancer". American Cancer Society. 3 January 2018. Retrieved 5 July 2018. ^ Bosanquet N, Sikora, K (2004). "The economics of cancer care in the UK". Lancet Oncology. 5 (9): 568–74. doi:10.1016/S1470-2045(04)01569-4. PMID 15337487. ^ Mariotto AB, Yabroff KR, Shao Y, Feuer EJ, Brown ML (2011). "Projections of the cost of cancer care in the United States: 2010-2020". Journal of the National Cancer Institute. 103 (2): 117–28. doi:10.1093/jnci/djq495. PMC 3107566. PMID 21228314. ^ Jönsson B, Hofmarcher T, Lindgren P, Wilking N (2016). "The cost and burden of cancer in the European Union 1995-2014". European Journal of Cancer. 66 (Oct): 162–70. doi:10.1016/j.ejca.2016.06.022. PMID 27589247. ^ Luengo-Fernandez R, Leal J, Gray A, Sullivan R (2013). "Economic burden of cancer across the European Union: a population-based cost analysis". Lancet Oncology. 14 (12): 1165–74. doi:10.1016/S1470-2045(13)70442-X. PMID 24131614. ^ "What Is Cancer?". National Cancer Institute. 17 September 2007. Retrieved 28 March 2018. ^ "Cancer Fact Sheet". Agency for Toxic Substances & Disease Registry. 30 August 2002. Archived from the original on 13 August 2009. Retrieved 17 August 2009. ^ Wanjek C (16 September 2006). "Exciting New Cancer Treatments Emerge Amid Persistent Myths". Archived from the original on 16 May 2008. Retrieved 17 August 2009. ^ Hayden EC (April 2009). "Cutting off cancer's supply lines". Nature. 458 (7239): 686–87. doi:10.1038/458686b. PMID 19360048. ^ Bagri A, Kouros-Mehr H, Leong KG, Plowman GD (March 2010). "Use of anti-VEGF adjuvant therapy in cancer: challenges and rationale". Trends in Molecular Medicine. 16 (3): 122–32. doi:10.1016/j.molmed.2010.01.004. PMID 20189876. ^ Sleigh SH, Barton CL (2010). "Repurposing Strategies for Therapeutics". Pharm Med. 24 (3): 151–59. doi:10.2165/11536770-000000000-00000 (inactive 29 December 2018). ^ Winther H, Jorgensen JT (2010). "Drug-Diagnostic Co-Development in Cancer". Pharm Med. 24 (6): 363–75. doi:10.2165/11586320-000000000-00000 (inactive 29 December 2018). ^ Begley S (16 September 2008). "Rethinking the War on Cancer". Newsweek. Archived from the original on 10 September 2008. Retrieved 8 September 2008. ^ Kolata G (23 April 2009). "Advances Elusive in the Drive to Cure Cancer". The New York Times. Archived from the original on 14 January 2012. Retrieved 5 May 2009. ^ Kolata G (23 April 2009). "Advances Elusive in the Drive to Cure Cancer". The New York Times. Archived from the original on 14 January 2012. Retrieved 29 December 2009. ^ Kolata G (27 June 2009). "Grant System Leads Cancer Researchers to Play It Safe". The New York Times. Archived from the original on 8 June 2011. Retrieved 29 December 2009. ^ Powell K (2016). "Young, talented and fed-up: scientists tell their stories". Nature. 538 (7626): 446–49. Bibcode:2016Natur.538..446P. doi:10.1038/538446a. PMID 27786221. Archived from the original on 27 October 2016. ^ Thamm, Douglas (March 2009). "How companion animals contribute to the fight against cancer in humans" (PDF). Veterinaria Italiana. 54 (1): 111–20. Archived (PDF) from the original on 23 July 2014. Retrieved 18 July 2014. ^ Murgia C, Pritchard JK, Kim SY, Fassati A, Weiss RA (August 2006). "Clonal origin and evolution of a transmissible cancer". Cell. 126 (3): 477–87. doi:10.1016/j.cell.2006.05.051. PMC 2593932. PMID 16901782. Wikisource has the text of the 1911 Encyclopædia Britannica article Cancer. Wikimedia Commons has media related to Cancer and Cancer statistics.